Wick Football Club twice let a lead slip on their way to a second consecutive Southern Combination League Premier Division defeat on Tuesday. Rob Hutchings and Joseph Matthews netted to give Wick 1-0 and 2-1 leads but Horsham YMCA powered back to run out 5-3 victors in the end. It has been a tough return for boss Jon Tucker so far, after losing out 2-1 to Hassocks on Saturday, before another defeat followed at YM. Hutchings fired Wick ahead after 17 minutes but Sam Schaaf levelled 12 minutes later. Matthews restored Wick’s lead eight minutes after the break but Schaaf netted again to make it 2-2 two minutes later. Philip Johnson then struck a brace of his own as YM went from 2-1 behind to 4-2 ahead in the space of six minutes. 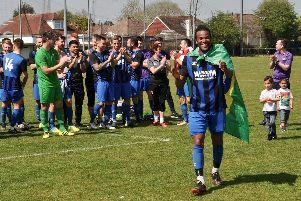 Substitute Morgan Forry set-up a nervy final few minutes when he bagged Wick’s third but Martin Smith’s strike in stoppage time ensured Horsham ran out 5-3 victors. WICK: Jordan Matthews; Williamson, Playle-Howard, MacIver, Cox; Joseph Matthews, Ediker, Chick, Hutchings, Gromett, Harper. Subs: Garnett, Hardwell, Forry, Weir, Madden.